After two years of meticulous planning and securing a proper funding mechanism, work has officially started on the Georgia Street corridor project that voters approved. The project is an overhaul from bottom up addressing water and wastewater lines, storm water collection, sidewalks and the actual street itself. 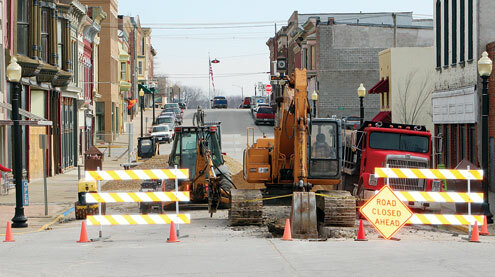 Mayor Bart Niedner pointed out that some of the infrastructure under the street is over 100 years old. He added that while this project will not solve everything, as the primary infrastructure artery it is a huge step in the right direction. “As soon as the project signs arrive and the weather cooperates, we will schedule a small groundbreaking ceremony to formally mark this occasion,” Niedner remarked. It is expected that construction will take about 20 months to complete and will include street closures in various, and sometimes multiple, places along Georgia. Financing for the project was completed as certificates of participation and is non-rated according to Steve Goehl of D.A. Davidson & Co.
Goehl assured the city following a rash of rumors regarding the project’s financing. Watch The People’s Tribune for more as the project continues.